It’s Birthday Week in this household!! My husband and I were born only 5 days apart, so we go big for our birthdays with a week long celebration. Today, I am sharing that celebration with all of you with these Chocolate Dipped Sprinkle Marshmallows! Aren’t they adorable?! I absolutely love how these turned out, especially because I think the short straws look like candles. Perfect for a birthday party! Plus, they are super colorful, and I love color! 1. Melt your chocolate for dipping in small increments to prevent burning. 2. Dip the marshmallow into the chocolate as far as you want covered. I decided only to do a little bit at the bottom. 3. Place sprinkles onto a piece of parchment paper or a shallow plate and roll the marshmallow into the sprinkles until covered. 4. Place Marshmallows onto parchment paper and let dry. 5. 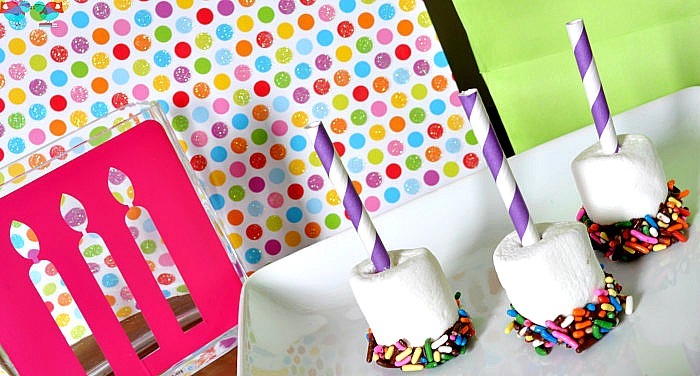 Cut the paper straws into thirds and wiggle them into the marshmallow. It’s My Birthday! Come get my gift to you! So cute! These are perfect for parties! I’m totally making these for my daughter! Great post! These look amazing and so easy to do too! I especially love the striped straws- very festive! Yum. I know my kids would love this. I love the fancy stems. These are so great! 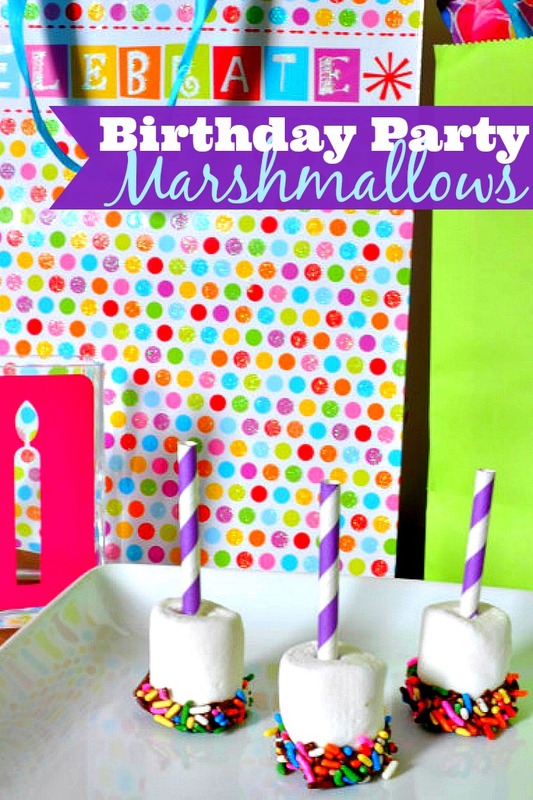 Really good way to color the marshmallows! This is such an adorable treat. I would like to do this to surprise my family at dessert time with Sunday Dinner. Those look delicious and are perfectly festive! Happy Birthday to both of you,by the way. These are cute! Something even my kids can help me with. I keep seeing all these amazing cake pop recipes and think “I need to do that”…but then get discourage by how difficult they seem…this I can do! Super easy and still fun to eat! I totally agree, Jessica! I’m intimidated by trying to make them pretty. I think mine would look like ugly blobs. what a fun idea – so easy too. Love it, I will have to keep it in mind for my kids birthday’s next month! Thanks! It was definitely an easy process! I make these quite often and think they are delicious and easy! Perfect for little ones birthday parties! Oh So Delicious & What Fun Ideas My Girls Are Going To Go CRAZY!! Thanks, Lisa! You should check out all the birthday posts from the last couple weeks. Lots of great ideas from some of my fave bloggers! Adorable! This would be so fun to make with my kids. Thanks for sharing! These are definitely a kid friendly recipe, especially if you give up perfection. My nieces went crazy and covered the whole marshmallow. So adorable! These are easy enough to make with the kids! Thanks! They’re definitely kid friendly, especially if you give up perfection. My nieces went crazy and covered the whole marshmallow. These look so good! My kids love dipped marshmallows. We are addicted to them. So yummy! These look like they are so much fun to make and eat! My daughter loves marshmallows and her birthday is coming up in April. I’m sure this would be a great treat for us all to enjoy. Awww, thanks so much! They are definitely yummy! These are just too cute and really do look like tiny birthday cakes! I love this idea! I need to make these for my kids. So cute! Thanks, Francine! I’m really excited about how these turned out. I can promise you – you won’t regret making them. So yummy! 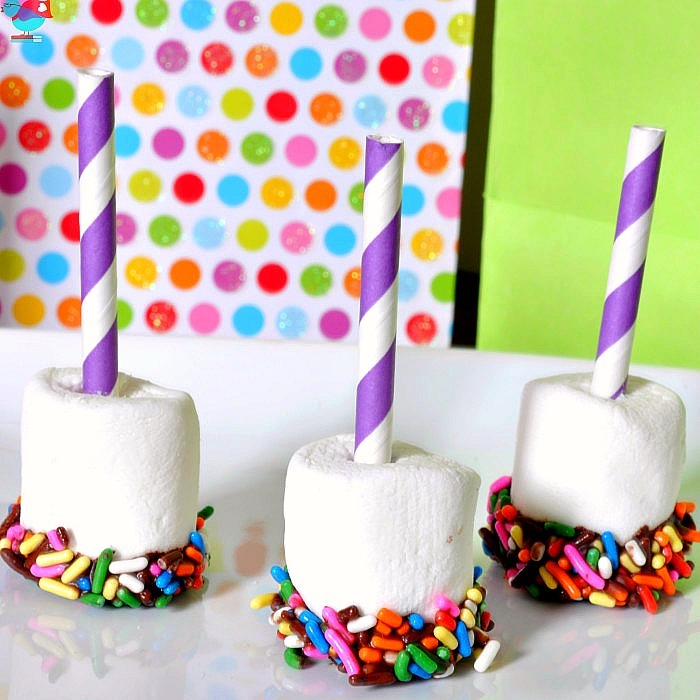 Those are so cute and you could totally make them in the color theme of the party with colored jimmies.